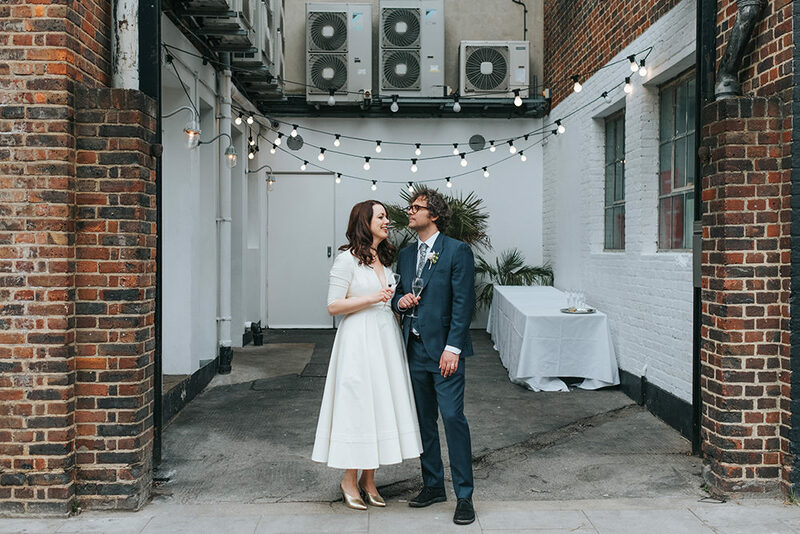 Weddings don’t come much more laid back or stylish than this intimate family focussed celebration in London’s East End. 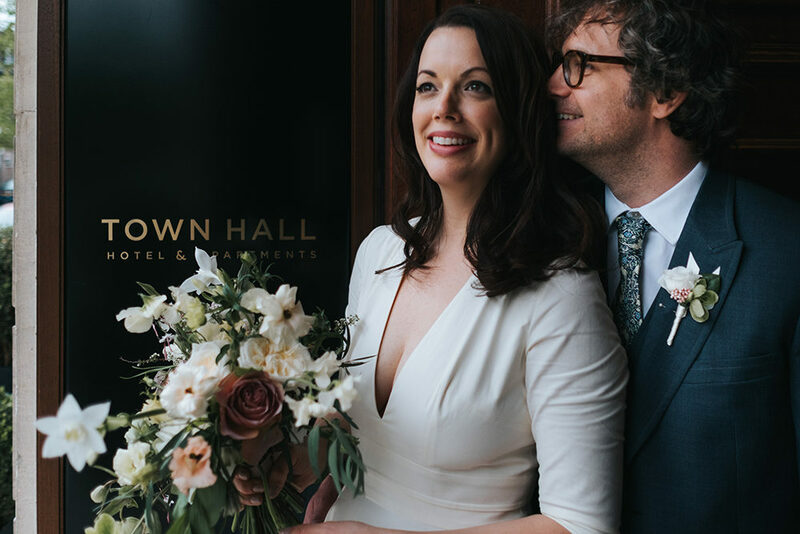 Town Hall Hotel is such an atmospheric place to hold your wedding ceremony and we love the relaxed, industrial vibes of Bistrotheque for dining – it’s the perfect place for a wedding breakfast that values both substance and style. 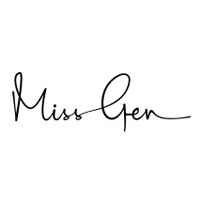 Our favourite lady Miss Gen was on hand to take the photographs and she’s done so in her natural gorgeous way. 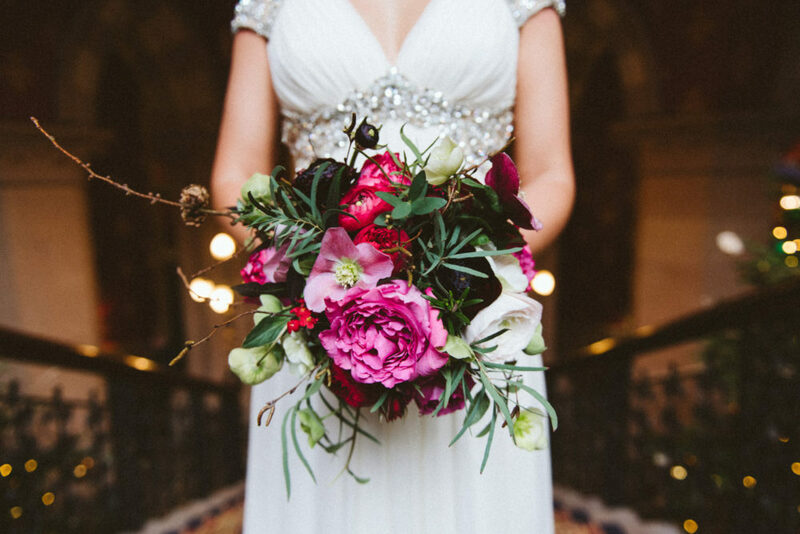 This wedding is full of heart as well as swoon worthy details, so enjoy lovely ones! 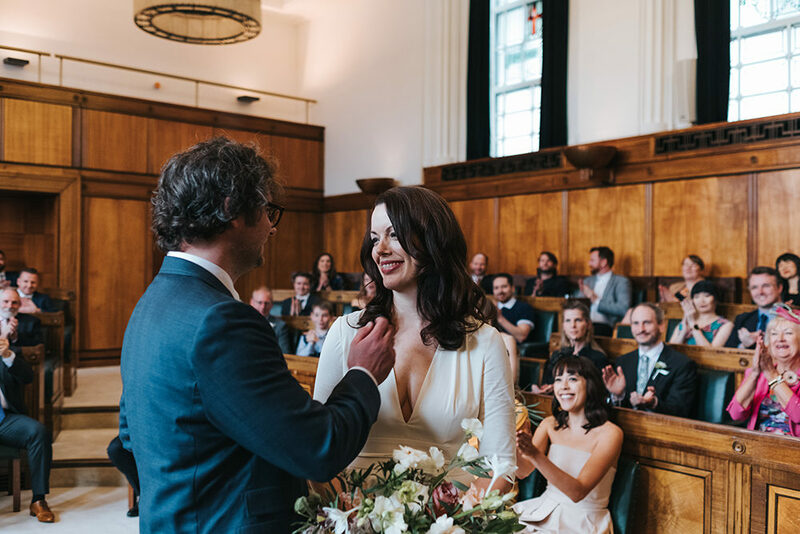 This gorgeous couple have had me smiling like a cheshire cat the whole way through their city wedding. 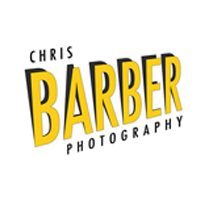 Chris Barber Photography has captured their infectious smiley personalities to a tee, making this a real joy to put together for you lovely lot. 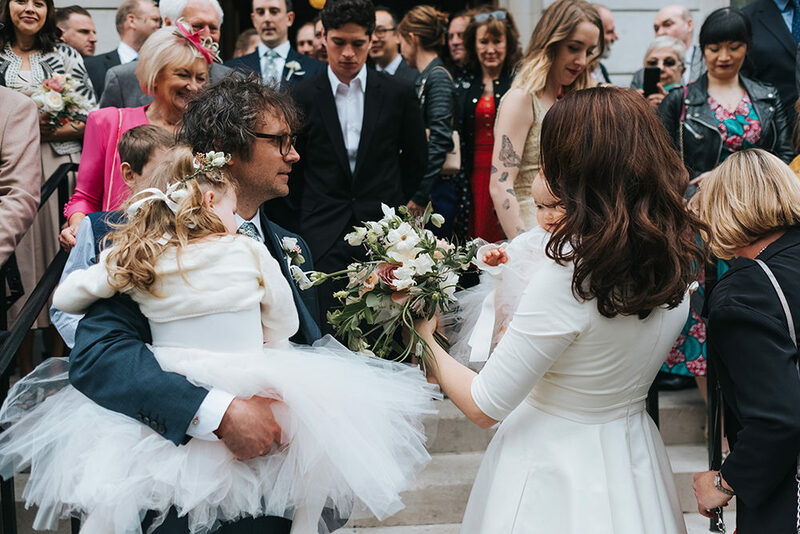 Plus bride Kath wears the most fabulous pink ombre Jenny Packham gown I ever did see. 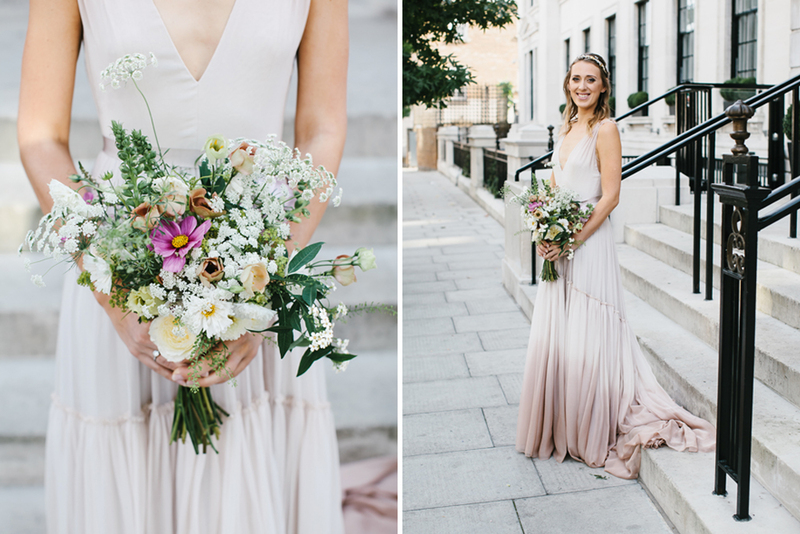 Making a real style statement and looking every bit the blushing bride. 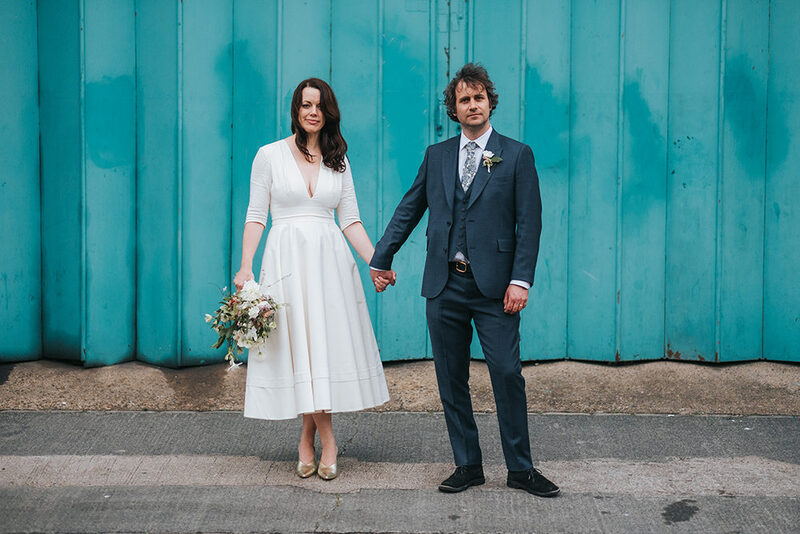 Groom Kel certainly knows a thing or two about fashion as well, looking very dashing in a grey suit and woven tie. 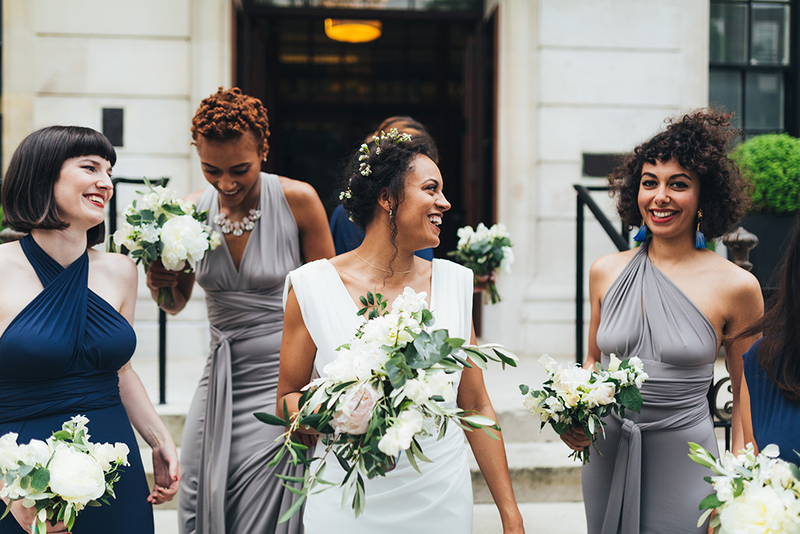 I adore the simplicity of this day. 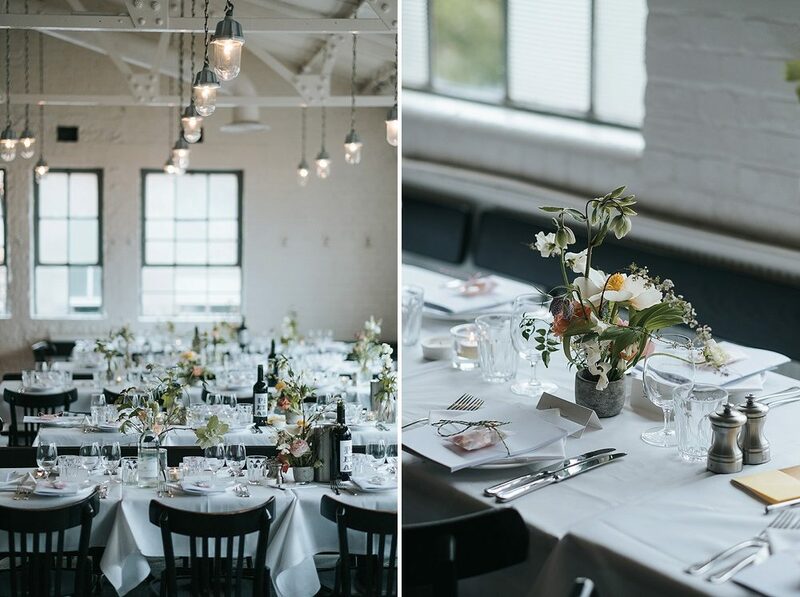 Opting for a registry office ceremony and a pub reception but making each venue fabulous with a plethora of wild blooms, DIY projects, fabulous decor and fun ideas. This is the first wedding I’ve seen with a personalised social media snapchat filter, but I hope it won’t be the last. Shall we take a look? 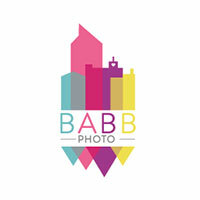 I think you’re going to go pin crazy for all the intuitive inspiration. 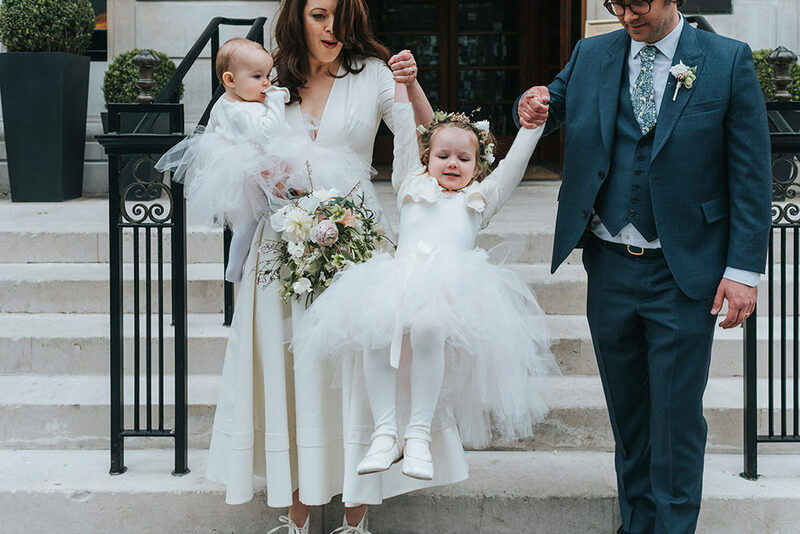 Bride Sarah had not one but two outfits. 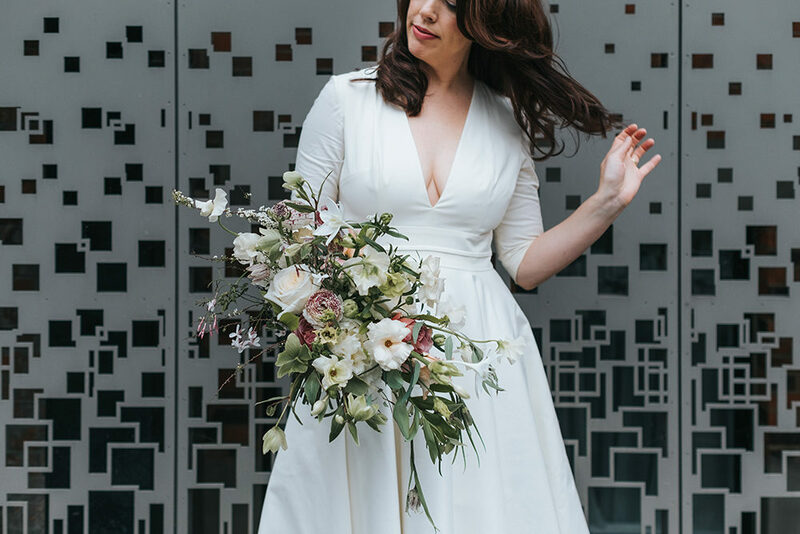 Going from sophisticated in a cowl back Cymbeline Paris gown to effortlessly chic in a modern AQAQ jumpsuit. Her groom Elliott brings personality to his attire too. Matching her in the style stakes with a fabulous checked jacket and salmon chinos. 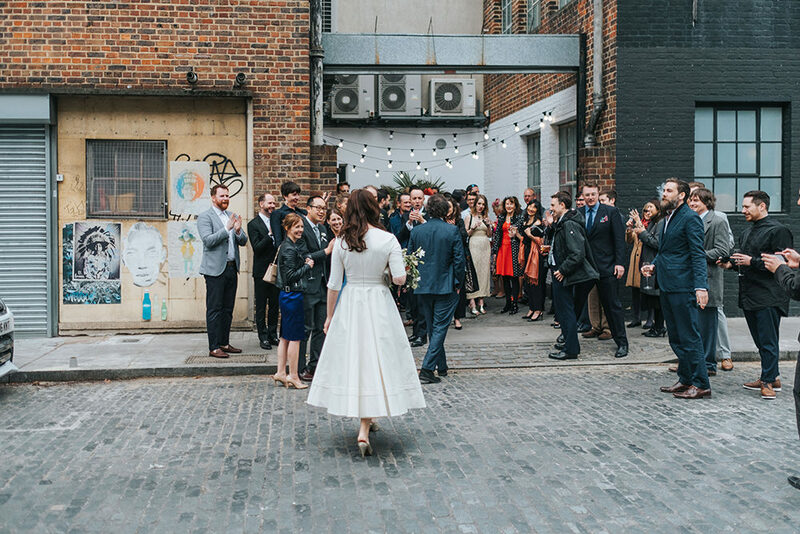 Taking to the urban streets and using it as a backdrop, Miss Gen Photography has captured some really memorable moments for this gorgeous couple to treasure as well as all that to die for fashion. 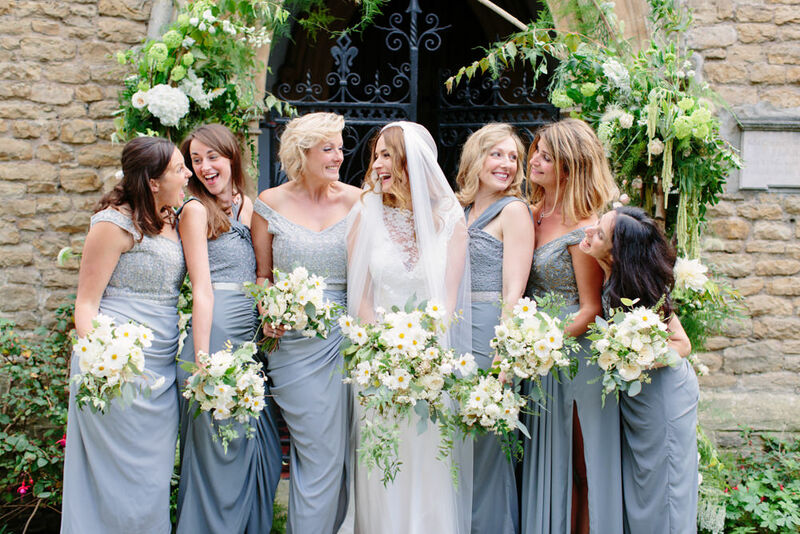 I also absolutely love the elegant navy & silver toned TFNC London Bridesmaid gowns. 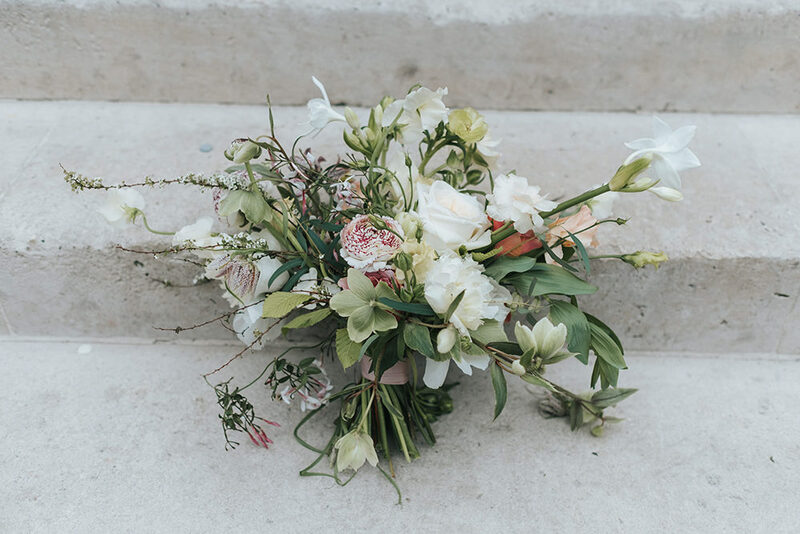 Complimenting the pure white and greenery bouquets perfectly. 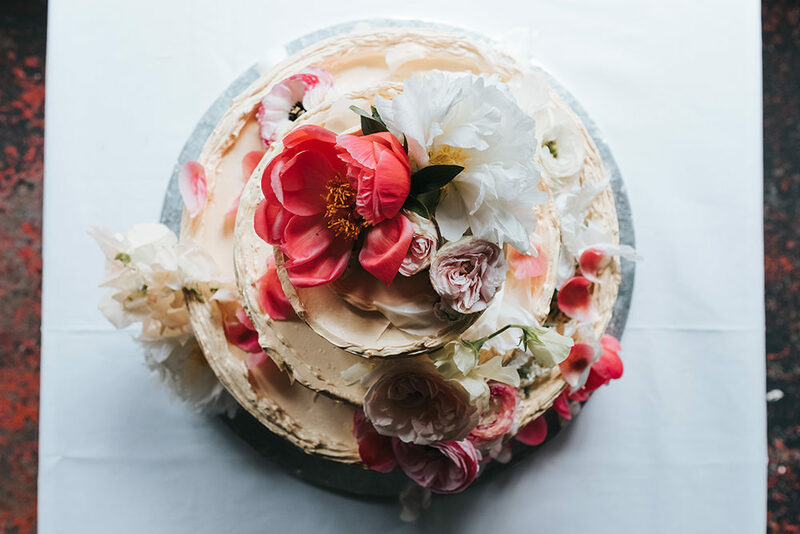 Plus did I mention the Krispy Kreme donut tower wedding cake…? 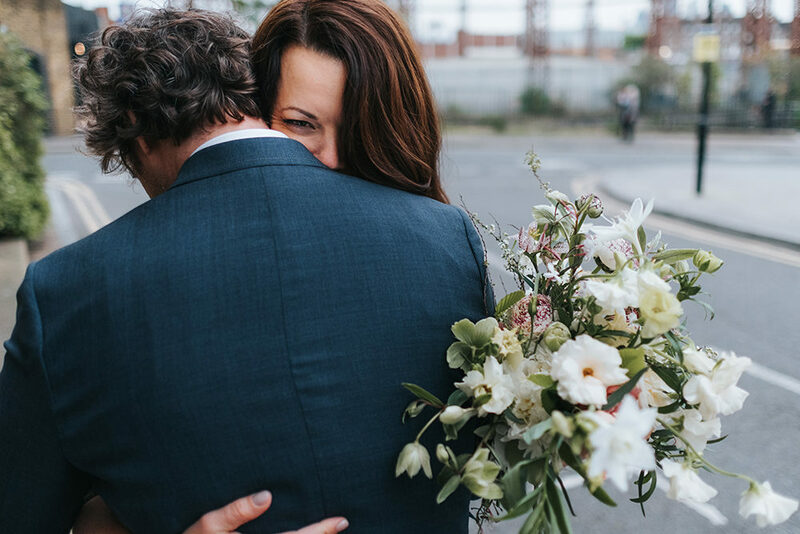 Katie & Tommy love London city, so the search was on to have a day full of everything they love, including a boat ride of the Thames. 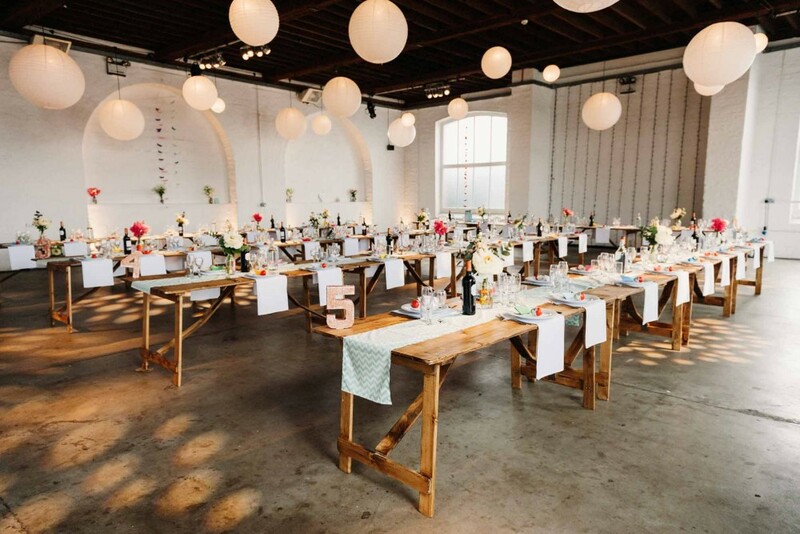 They stumbled across Trinity Buoy Wharf which is a great dry hire venue and meant they could have a wedding that truly reflected them. 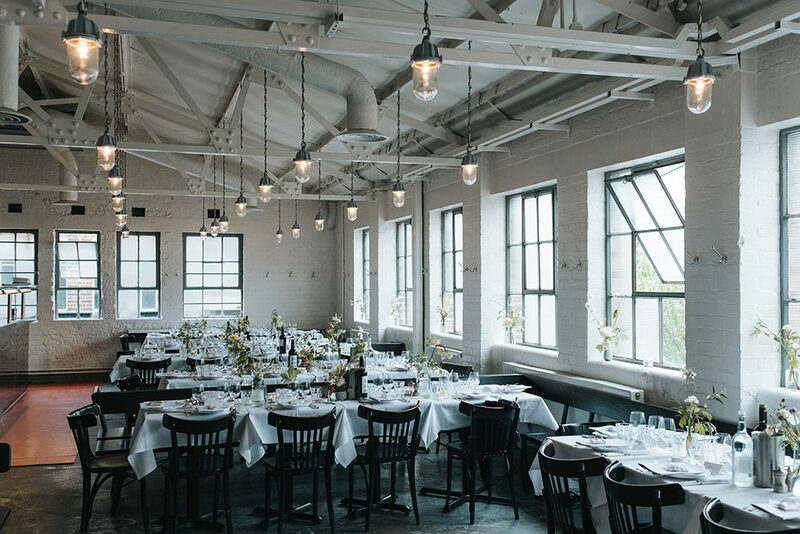 There’s hanging lanterns, trestle tables and paper origami boat name place tags as well as a sweet treat Kinder Surprise favour. Plus the most spectacular paper flower altar backdrop made by Katie’s super talented Mum which you are going to absolutely LOVE. 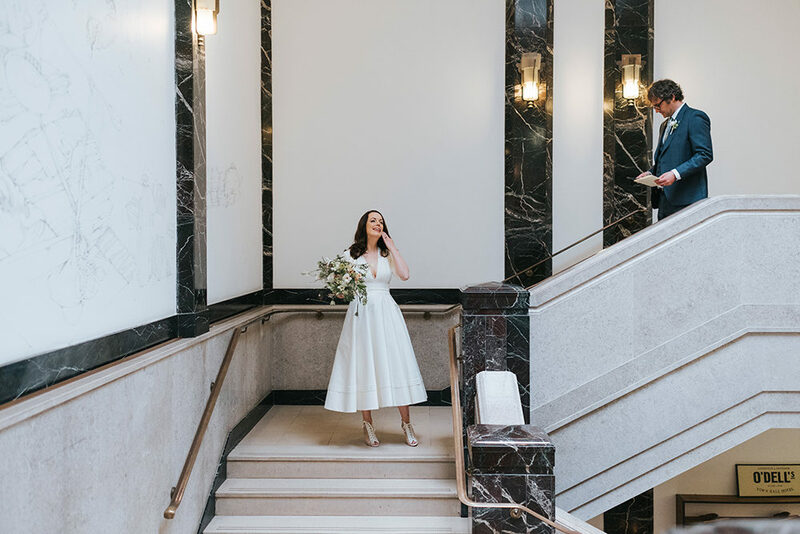 But onto our gorgeous Bride, she is the picture of elegance in her Jesús Peiró gown, and her laser cut Rupert Sanderson shoes….let’s just say you have to see them….oh my I’m green with envy!